If there is a quintessential Andhra dish, it is gongura. This is a sour, leafy plant—usually described as sorrel (hibiscus sabdariffa) and sometimes as roselle—that is added to traditional dishes of the Andhra cuisine to give these an unmatched zing. So you have gongura with dal or gongura with meat and chicken, although the most popular item remains the gongurapickle that is available in supermarkets across the country. I am a gongura aficionado, having been introduced to its distinctive sour taste many decades ago during a brief sojourn in Guntur district, which reputedly produces the best leaves. I’ve had it cooked with the best known Andhra dishes, and eaten it in homes, restaurants and dhabas. It is every Andhra housewife’s stock in trade, and no canteen or restaurant serving “Andhra meals” will hire a cook who does not know his or her gongurain all its variations. Such is the addiction of fans that an enterprising company in a small town in West Godavari district has been selling bottles of chicken gongura pickle at a bargain Rs 150 for 500 grams. So why, and how, could someone seek a patent on a tried-and-tested pickle recipe? Here’s the shocker: the patent has been sought by none other than a group of scientists of the Indian Council of Agricultural Research (ICAR)—all of them working at the National Research Centre on Meat (NRCM) in Hyderabad. The lead scientist in the group of six who claimed to have developed “a process for preparation of chicken gongura pickle and chicken soup from deboned chicken frames” is B M Naveena, who was awarded the LalBahadurShastri Outstanding Young Scientist Award-2013 in July this year. In his application for the award, Naveena had claimed to have four published patents to his credit, one being for the ubiquitous chicken gongura pickle. Although Naveena refused to tell Down To Earth why his process was patent-worthy, he is on record as saying, “Traditionally, people make gongura pickle or chicken pickle. Ours is chicken gongura pickle with a specific process involving at least eight steps. It is made without the use of vinegar, citric acid or lemon. That is the difference.” All of which should make any gongura lover bristle. The leaf is so sour that none of these ingredients is ever used in the making of any dish based on this leaf. Reacting to Naveena’s claim, a well-known patent expert had noted that the combination of chicken and gongura was “a mere aggregation” and cannot be the basis for a patent claim. For a column that has been looking on and off at scientific frauds in the country, there is a despairing sense of déjà vu in the chicken-gongura story. Not so much in the absurdity of the patent claim as in the fudging that is apparent. The fact is that no such patent has been awarded yet, or is likely to be. A search of the Indian Patent Office records reveals that Naveena’s claim is yet to be examined and that an opposition to the patent has also been filed. The fudging is in the use of “published patents” by NRCM and Naveena. In their dictionary, it appears to mean that the patent office has published their claim. As Naveena told Down To Earth: “I have four published patents… The novelty and merit of these patents can be challenged by anyone once they go for examination.” ICAR, on the other hand, assumes—just as we all do—that these patents have been awarded to Naveena. Its citation states that the NRCM senior scientist’s “patented work” has “huge demand” and that “many of these technologies (more on these later) have been commercialised to small- and medium-scale entrepreneurs with great success”. ICAR’s tendency to confer its most prestigious awards to scientists with a lively imagination—and secure patronage—is well known. A few years ago, ICAR awarded its top prize, the prestigious Rafi Ahmed Kidwai Award, for outstanding research in agricultural science to K C Bansal based on his imaginary claim that he had “filed three patents for novel gene discovery”. It turned out that Bansal, a senior scientist of the Indian Agriculture Research Institute, India’s premier institute for research and education, who at the time was heading a crucial project on transgenic crops at the National Research Centre (NRC) on Plant Biotechnology, had done nothing of the kind (see “The Maya of Indian Science,” Down To Earth, December 16-31, 2012). 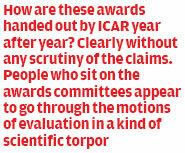 How are these awards handed out by ICAR year after year? Clearly without any scrutiny of the claims and without even a cursory look at the work that is being promoted by the institutions. The scientists who sit on the awards committees appear to go through the motions of appraisal and evaluation in a kind of scientific torpor with little interest in seeking out merit, much less outstanding work. Sadder still is the cronyism and unethical practices that are undermining ICAR’s attempt to tone up the working of its close to 100 institutes. In recent years, it has launched a concerted drive to commercialise the research of 4,800 scientists in its institutes through a policy of rewarding intellectual property rights (IPRs). Not only does ICAR fund the tedious and expensive process of seeking patents by its scientists, it always awards marks (2-3) to those scientists who hold patents or have been able to commercialise their work. This is a major incentive when prized research projects are being handed out and more so when appointments to plum posts are considered. In the 11th Plan, a separate fund of Rs 49 crore was earmarked to promote IPRs and ICAR has been passing this on to its top institutes, of which the 17 NRCs constitute the cream. Under the guidelines issued by ICAR, its research institutes have the autonomy to decide which output qualifies for patents once they go through the due processes. To start with, research findings have to be submitted to the Institute Research Committee, Research Advisory Committee and the Quinquennual Review Team to evaluate the authenticity and novelty of the work. Only after approval by these committees can any work be published or submitted for patenting to the consultancy processing cell of the institute, which will then verify and forward it to the Institute Technology Management Committee. This committee will get the application ratified by the Project Monitoring and Evaluation Committee. This begs the question: how are claims such as Naveena’s thought fit for patenting? Another of the patents that Naveena along with other NRCM scientists has sought is a process for improving the shelf life of meat through what they call innovative super-chilling technology. Experts say it is a process that has long been in use in the meat and fish processing industry the world over. The claim they make is for “an innovative super-chilling (storage at -1°C) and vacuum packaging process for buffalo meat steaks and mutton chunks which significantly improves the shelf life up to three months without freezing compared to 30 days and 4 days at refrigeration temperature under vacuum and aerobic packaging conditions respectively”. NRCM is doubly guilty since it published in its annual reports the details of both the chicken gongura pickling method and the super-chilling technology that its scientists “invented”. As anyone familiar with patent laws knows, this makes whatever claims NRCM scientists are making “prior art”, which means that which is already known. In other words, NRCM has landed itself in a pretty pickle. In NRC Meat a group of scientists are doing these kinds of fraud practices as there is no proper scrutiny process existing in that centre. Every housewife in Andhra know chicken gongura. It is a well known already existing recipe. More over it is a catering work and not related to meat technologists. Only God has to save NRCM from these scientists. The Director of the centre who entertains such frauds and the scientists involved must be severely punished by ICAR. For filing one patent ICAR is spending around Rs 50,000. Public money is wasted. It looks like Latha Vishnu Madam did a lot of research on this issue. Well done. Will ICAR take action against the involved scientist in the fraud? There is no surprise in this forged patent filing by these scientists. Since 2001 all these are doing lots of manipulation as there was no strict monitoring device in this centre. Without the head of the centre's help this cannot be possible. Public money is wasted. Patent for Gongura chicken? Tomorrow these scientists will file patent for chicken curry and mutton briyani also. Sad state of meat research. Scientists from NRC Meat are known for emu meat processing in which they make private money. Some emu farmers are using the name of NRC Meat for their advertisement. An article published by Hon'ble Minister for Women welfare Ms. Maneka Gandhi explains how emu farming is non viable. But these scientists are promoting emu meat especially Dr Naveena who claims to be emu scientist in India. Without knowing what is patent these scientists are filing some known work as innovation. For cheating the nation, will ICAR give them some punishment? Major penalty will be the solution. But these scientists are having strong support of the director and he will protect them and this will continue. Only fraud scientists can reach top positions. It is ridiculous to seek patent for an existing procedure that too for chicken gongura pickle. Can the scientists explain the feasibility of getting patent for pickle? Will anyone pay for this patent? The Director who acts as the research manager must be punished. Super chilling is a world known technology all over the world. There is no innovation in super chilling. Many companies are already doing that. These scientists are leading lavish life in Hyderabad without doing any research. All their publications must be scrutinised. I appreciate the correspondent's attention to the nimble fraud & malpractices by the so called Scientists in INDIA. Probably, the scientists in INDIA need to be more educated on Scientific Integrity and the sanctity of public trust. In the rigorous field of Science, the acts of such few Scientists like Dr. Naveena may discourage genuine hard working real scientists. Public & Government awareness should be more. Author did a good job in exposing this science fraud. This kind of frauds become very common now. ICAR must be intolerant to science frauds. Involved scientists must be terminated. Immediate withdrawal of the award followed by enquiry and severe punishment. This type of research forgery cannot happen in China. The guilty will be imprisoned there. Not only in patents, in research papers also these group of scientists did extreme frauds with manipulated data. It will come out soon. Is there a need for a meat research centre at the national level? Not required. Why? All the SAUs are having meat science departments which amounts to nearly 70 departments all over the nation. These meat science departments under the SAUs are doing excellent work. Under Kerala Veterinary University a meat science department is functioning at Trichur Veterinary College which makes a profit of Rs 1.5 crores annually. Their research activities are non matched with the research of NRC Meat. Here the scientists are fond of white collar jobs. Not only Trichur veterinary college, Madras, Namakkal, Hissar, Ludhiana, Pantnagar and Tirupathi veterinary colleges are doing good research in meat science. NRC Meat is a bizarre research centre. It is a head-ache to ICAR. No more comments. I am from West Godavari. I am from West Godavari. After reading this article I am recollecting. In 2011 when I attended poultry expo in the Hi-Tech City Hyderabad, these scientists were distributing a brochure which was having the procedure of chicken gongura methodology. As chicken gongura pickle is so popular in our district as well as state, I collected the brochure. As the author mentioned once the method is out to public it cannot be patented. This application was made in 2012. So these scientists are at fault. How can one file patent for a well known procedure? Did the research monitoring committee examined this? Whether the scientist Dr B.M.Naveena overlooked the monitoring committees such as PME etc? They must probe how an existing procedure was allowed to be filed for patent wasting a big amount for patent filing and attorney charges? Here not only scientific cheating involved but also financial looting of public money is involved. The scientist and the director must be punished. Super chilling is a world known technology not a new innovation. For the sake of getting award a false information was furnished by Dr B.M.Naveena which was knowingly forwarded by the director Dr V.V.Kulkarni with a team work of cheating the nation. Development of recipe of a meat product is not the job of meat technologists. It is a catering research. It is a wonder how these kind of projects are approved by research approval committee? Under which approved project this development of chicken gongura pickle was done must be investigated. And what was the role of each scientists connected to this patented must be investigated. These scientists are having a habit of adding all their friends name in the authorship whether they were connected to or not. This is another cheating on authorship. It looks like the Scientists like Dr.Naveena think they can get away with their dishonest tactical manipulations. This may help to come up in their career as the Indian System is prone to such malpractices. Thanks to the author who has painstakingly blew the whistle. Hope the concerned authorities(is there any?) wake up and save the scientific field. Science is driven by open and brutal tryst with truth, not by crooked backdoor entries. Plagiarism is also existing in this centre. A set of scientists work in a group with director's support and they engulf their colleagues work if it is an excellent work. I heard that now such things are going on. NRC Meat is full of gimmicks. NRC Meat is full of gimmicks. They are also doing research on pesticide residues. The concerned scientists cannot run one sample individually. If that study is probed many truths will come out. In this centre if the ITMC in-charge name is added in the patent it will be filed immediately. Patent for pickle by ICAR scientists belonging to NRC Meat shows the quality of research our scientists are involved. nrc meat scientists won't do any research. they are all posh scientists of icar. They knew what is what. They are doing knowingly. ICAR has given them an attorney officially. These scientists intelligently blocked the facts about their own prior art and about existing procedures. ICAR attorneys also did not do patent search before filing the application. I checked all the 3 patents filed from NRC Meat. I found a strange thing in the authorship. Only the same group is involved in all the three. That means there is a lobby working there. Latha Ma'm did a hard work in exposing these falsification of patent claim. Now it looks like so many research frauds from this centre may come out. In ICAR, veterinary scientists are getting 25% more salary than other agri scientists as they get additionally non practising allowance. The average salary of these scientists are around Rs 1.5 lakh per month. Pickle preparation justified their salary. i think Indian agriculture needs to be protected from the Scientists in ICAR. Gongura Chicken pickle is a common product made by house wives in Andhra Pradesh. There are several enterprises in Bhimavaram town in West Godavari dist. K.C. Bansal case is a great discouragement for budding scientists like us. ICAR needs a whole revamp.I think it is the worst scientific institution in India to work for....sadly I am in it. If what is reported is true,it is simply shocking. It is a well known fact that in India awards and recognition means in any field whether it is education,film,science and technology etc.in some cases more than merit other considerations like PUSH PULL Approach dominates. I give a concrete example. Several of my Innovative ideas with illustration were published in INVENTION INTELLIGENCE in the past, and when I applied for NRDC awards with more details ,not even a certificate was given. When the ideas are useless why should the journal of the organisation publish it at all? Perhaps because there is no money involved for the published ideas ! Also you find in publications there is a sea of difference between foreign and Indian Journals. The foreign journals see the merit in the publication even though it takes time for publication. On the other hand Indian Journals in some cases see the name of the established contributor whether his name is in the beginning ,middle or last. Even in sanctioning the research projects big established institutes get the maximum whether there is merit in them or not in some cases. Here again PUSH PULL approach. In fact small institutes in many cases take pride in having projects and they do it with commitment. On Patents. It has become a fashion to file patents to get recognition. 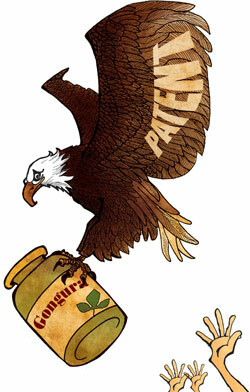 The real value of patent reveals only when it is commercially exploited. It is a Rat Race.Ã”Ã‡Ã˜ Even if one wins the race , one remains still ratÃ”Ã‡Â£as the saying goes. Finally about the so called National Conferences. It is a routine feature that National Conferences are held round the year if one manages funding. It is evident at Indian Science Congress Association inauguration mostly by the Prime Minister (Except once President inaugurated in Calcutta as it was election time) the enthusiasm dies down after the inaugural function.I attended several International/National Conferences giving Keynote Address and Chairing in some cases. In some cases it is a pleasure trip to the participants and Registration Fee and Exhibition fee for organizers ! At an International conference the registration fee was US$ 2000 ! Ultimately in some cases it boils down to the fact,Ã”Ã‡Ã˜ Conference is a group of people who individually can do nothing but collectively meet and decide that nothing could be doneÃ”Ã‡Ã˜. Is there any standards set for the Indian Scientists? How projects like 'Pickle Making' are funded by ICAR? I believe there is no need of any research to find how to make 'Pickle' especially in ancient countries like INDIA where people lived on pickles from time immemorial. Apart from doing sub-standard research, these funny scientists have applied for Patent? Really!!! OMG..., I think even God will be helpless to save Indian Scientific Research, unless a complete administrative overhaul is done from top to bottom of ICAR. The salary of scientists of NRC Meat are significantly higher than ISRO scientists. One side the dedication of ISRO bringing fame and other side the scientists of NRC Meat are spoiling the research quality of our country. Patil Shivana Gowda Girish et al. Dr.B.M.Naveena is also part of this patent application 2724/CHE/2010 and this is also one among his 4 published patent as per his claim in the Lal Bahadur Award application as per news papers report. A four years ignored patent application which is now withdrawn by the patent office was mentioned in his award application and cheating the award committee, he successfully managed a prestigious award which was given to him by Honourable Cabinet Minister for Agriculture. It means he cheated the nation. Will ICAR take serious action? Gongural pickle is an ancient Indigenous Technical Knowledge (ITK) . It is ridiculous to file patent for an ITK. Where are the forums for ITK who are not raising this issue? If such thing happens tomorrow these scientists will file patent for all the ITK. It is known to entire ICAR that Dr.B.M.Naveena is very close to that centre's director, Dr.V.V.Kulkarni. Due their closeness, to falsely promote him he might have forwarded the application closing his eyes without verifying the claims he made in the award application.